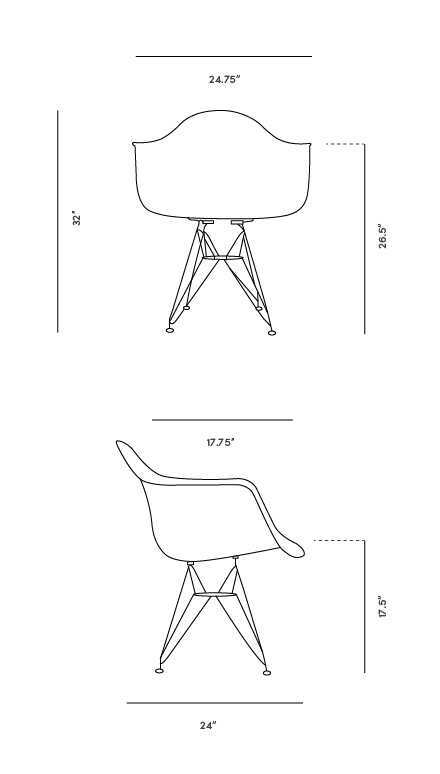 The welded Eiffel base and organically shaped polypropylene plastic shell were completely new structural forms in the industry when they were designed, resulting in one of the first industrially manufactured plastic chairs during the mid-century modern era. The now iconic design includes a high, flexible back, deep seat and waterfall edge for intuitive comfort. An ideal piece of contemporary furniture for the home or office, this playful chair is a delightful addition to the modern room. Great value and good quality. I have not received the product yet, but looks to be a well made version of the original. Really cute RAR chairs. Great service and the chairs were easy to put together. I just ordered the product so I'm thrilled to receive it and test it! We are in LOVE with these chairs! We ordered them for our dining room and they look amazing. I love seeing people's reactions to them as they are a little out of the ordinary. I was anxious about finding a table low enough in height to fit them but we went with a standard 32 inch and they look and feel great.. Delivery was earlier than I expected and they communicated well about when they were coming which helped us plan ahead. Our product arrived in perfect condition. Customer service was awesome. I even spoke with the same person during multiple calls. The follow up after was also great. I felt like the company really cared about delivering great service and product. A++ Rove Concepts! You are definitely bookmarked for future purchases!